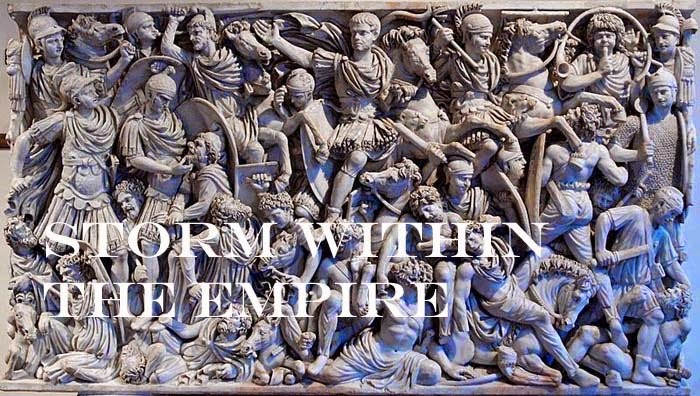 Storm within the Empire: Migration to Kingdom – play testing scenario 409 AD. Migration to Kingdom – play testing scenario 409 AD. During the winter months of January and February discord among the Vandal tribes reached a boiling point such that the Asding and Siling groups formerly split. Alan marauding parties were seen further south in the region of Viennensis. The Suevi were content to remain in the lower province of Maxima Sequanorum away from possible reprisals. Many of the landed aristocracy who voiced their discontent at the intolerant situation the previous year were now talking rebellion. The debate among the provincial senators March produced not one but three candidates that ironically all stepped forward seize the throne in the same month. Constantine III marched on Lugdenensis III to deal first with Gerontius. Constantine III’s forces, though outnumbered by Gerontius quickly moved forward to engage his main battle line. Locked in combat, the Alan appeared in time (flank march stratagem) to see Gerontius in full retreat leaving a full third of his force dead on the field. Occupied with suppressing revolts, the barbarians were able to raid unmolested most of Lugdunensis in the month of April. After his victory over Gerontius, Constantine III returned to central Gallia in May. Here, the presence of the army formed a breakwater forcing the Vandals steer northerly course and the Alan a southerly direction. By the first week of June, Constantine III marched his army north to suppress a second rebellion taking place in Armorica. The speed of his approach caught the army of Armorica completely off guard (rapid deployment stratagem). In less than an hour victory had been achieved with a goodly portion of the former army of Armorica now marching south with a new paymaster. Events heated up in July as Constantine III confronted a Siling marauding party and defeated them. Likewise, an Alan column caught and severely handled an Asding raiding party capturing their camp and spoils. Similar operations continued in August and September, the effect of which channelled the Vandals in a southward direction toward Hispania. The Asding Vandals had crossed the Pyrenees in October with the Siling hard on their heels. The Germanic group known under the collective name the Suevi would settle in lower Gallia. The Alan were also content to settle in Gallia. Having served well as allies, Constantine III moved a number of tribes to Armorica to keep order there. Others found new homes with their cousins the Sarmatae who settled in central Gallia some generations earlier. By winter all the Vandals with some Alan tribes had made the crossing into Hispania. Maximus, who was quick to rebel, would now have a tough dish to swallow come spring 410.